For the fiscal quarter ended Saturday, December 28th, Apple will report record revenue and earnings per share. There’s no disputing the popularity of Apple’s iPhone and iPad product lines. As of today Wall Street analysts are expecting revenue of $57.31 billion and earnings per share of $14.05. This is in contrast to revenue of $54.51 billion and eps of $13.81 in the prior-year quarter. As the founder of the Braeburn Group, I am currently collecting December quarter estimates from our global network of independent analysts. Although management has guided to revenue in the quarter of $55 billion to $58 billion, the independents by and large are expecting a revenue performance above the upper threshold of guidance. I will be publishing the Braeburn Group Estimate Index for the quarter on Sunday, January 5th. However, Apple’s quarterly results are merely a static snapshot of a fast-moving enterprise object. More than a purveyor of independent device lines, Apple has become a customer relationship continuum with a global platform of inter-related products and services. Among the factors influencing near-term results are management’s decision to increase the amounts of device sales revenue deferred for recognition in future periods, the pace of the company’s geographic expansion and the seasonal nature of the company’s product refresh cycles. Apple’s growth is best viewed not by quarters but by fiscal years. In today’s article I will look at Apple’s growth across a variety of measures and metrics. The graph below illustrates Apple’s FY2013 revenue mix by product line. In the fiscal year ended in September, over 72% of the company’s reported revenue was derived from the iPhone and iPad product lines. While this concentration of revenue in two product lines for a company that reported over $170 billion in revenue might on the surface seem alarming, the concentration of revenue is emblematic of Apple’s dynamic product mix and the changing nature of the digital device markets. The graph below illustrates Apple’s revenue growth by product line in fiscal years 2012 and 2013. In FY2013 the rates of revenue growth in year-over-year comparisons were impacted by the release of the lower-cost iPad mini and slowing rates of growth in the high-end smartphone market. While the average selling price (ASP) for the iPhone fell from $629 in FY2012 to $607 in FY2013, the average selling price for the iPad fell from $531 to $450. Moving into FY2014, the reported ASP for the iPhone will be impacted as much by the recent change in deferred revenue on each iPhone sold as any other factor. Apple’s apparent ability to meet demand for the iPhone 5s more quickly than for any new iPhone release in the past will assist in stabilizing reported revenue per unit sold. The Retina display iPad mini, at a higher per unit price than the original, will buttress the iPad’s ASP this fiscal year. In FY2014, there will be a stronger correlation between the rates of unit sales growth and revenue growth than in the slower-growth FY2013 that ended in September. Apple’s December quarter will be the highest reported revenue quarter in the company’s history and earnings per share will reach a new high as well. During this quarterly period Apple will sell over eighty million iPhones and iPads combined while setting new records for unit sales of the company’s two most popular product lines. Despite these superlatives, Apple is taking a scenic detour on the road to reported growth. Long gone are the meteoric rates of growth of fiscal years 2011 and 2012. In FY2011 revenue rose 65.96% and in FY2012 revenue advanced at a 44.48% rate. In the fiscal year ended in September, Apple’s reported rate of revenue growth was a dawdling 9.20%. For the first time in years, Apple reported negative earnings per share growth in FY2013 following a 59.60% rise in eps in FY2012 and an astonishing eps growth rate of 82.64% in FY2011. The graphs below illustrate the company’s slowing rates of reported revenue growth and the impact of slowing rates of revenue growth on Apple’s earnings per share. Since the third fiscal quarter of FY2012, there’s been a marked decline in Apple’s quarterly rates of revenue growth. Although the company continues to deliver record revenue each fiscal year and so far has escaped a year-over-year decline in quarterly revenue, there’s no mistaking the dramatic drop in revenue growth rates over the most recent six fiscal quarters. Apple’s earning per share has been negatively impacted by the slowing rates of revenue growth. In each quarter of FY2013, Apple reported negative eps growth despite a continuing reduction in the number of fully diluted shares from the ongoing $60 billion share repurchase plan. In an article published last month, I discussed Apple’s average selling prices by product line and Apple's declining rates of iPhone and iPad unit sales growth. Today I’m illustrating Apple’s declining gross margin. The influence of a dynamic unit sales mix and management’s efforts to deliver competitively priced products have led to an unmistakeable decline in gross margin on products sold. From a high of 47.37% in FQ2 2012 to a low of 36.90% in FQ3 2013, Apple’s gross margin has been on a steady decline over the last six quarters. The introduction of the lower-margin iPad mini in the fall of 2012, negative Mac unit sales growth over the most recent four fiscal quarters and more aggressive iPhone sales efforts in emerging markets have combined to reduce the company’s gross margin performance. On October 28, 2013, Apple announced quarterly results for the period ended September 28, 2013. For the quarter, Apple announced revenue of $37.472 billion and earnings per share of $8.26 on 909.131 million fully diluted shares in the count. Net income was precisely 20% of reported revenue in the period. What surprised the market was Apple’s very conservative guidance for the December quarter. Although the quarter will most likely represent the highest revenue, net income and earning per share quarter in the company’s history, management has guided to revenue of between $55 billion and $58 billion and gross between 36.5% and 37.5%. The top end of revenue guidance suggests a 6.4% year-over-year revenue gain and the gross margin guidance range suggests a deterioration in the company’s year-over-year gross margin performance. In the year-ago quarter, Apple reported gross margin of 38.63%. In the challenging fiscal year ended in late September, Apple reported revenue growth of 9.2% to nearly $171 billion. iPhone unit sales in the fiscal year rose 20.16% to 150.257 million units and iPad unit sales rose 21.82% to 71.033 million units. At this time, there’s little reason to expect the unit sales growth performance from the company’s two most popular product lines to fall below the FY2013 rates of growth. But with all things Apple, there’s much more to the story. 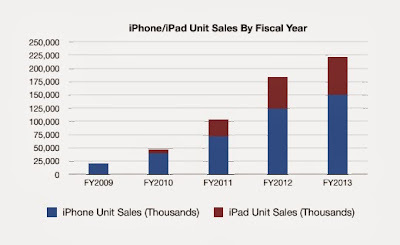 The graph below illustrates the combined unit sales of the iPhone and iPad lines over the most recent sixteen fiscal quarters, including iPhone unit sales in the quarters immediately preceding the original iPad’s release in the spring of 2010. In each quarter of the sixteen quarters there has been year-over-year unit sales growth of no less than the recent September quarter’s 6.47% rate of growth. In the December quarter one year ago, combined iPhone and iPad unit sales rose 34.63% to 70.649 million units. The graph below illustrates combined iPhone and iPad unit sales by fiscal year. In the fiscal year ended in September, combined iPhone and iPad unit sales reached 221.29 million units on a 20.90% rate of unit sales growth. Still, Apple has guided to no more than 6.4% revenue growth in the current December quarter. On Monday, September 23rd, Apple announced the company had sold more than nine million 5c and 5s handsets in the first weekend of sales. The surprisingly high unit sales number for Apple's newest iPhone handsets caused analysts to rewrite and reconsider their narratives on Apple's prospects for early success. Speculation turned to talk of high channel supply of the iPhone 5c as the source of the expectedly high unit sales number. Analysts had previously cautioned Apple's apparent unwillingness to release a lower-cost handset for emerging markets would dampen the sales growth potential of the new models. Confusing matters even more, on September 23rd Apple filed a Form 8-K reiterating revenue and gross margin guidance for the September quarter and indicating revenue would be near the top end of the revenue guidance range of $34 billion to $37 billion and gross margin would be near the top end of the guidance range of 36% to 37%. Apple ended the June quarter with about 11 million iPhone handsets in the global channel while also reporting an increase in component supplies. In the June quarter iPhone sell-through was greater than reported unit sales because Apple reduced channel supply in the quarter from about 11.6 million units at the end of the March quarter. In other words, more iPhones were sold to end users in the June quarter than Apple reported as unit sales. In the September quarter one year ago, Apple reported ending channel supply of 9.1 million units. At the time, iPhone 5 supplies were constrained and ending channel supply was below the desired range of 4 to 6 weeks of supply on a look-forward basis. Because Apple chose to replace the iPhone 5 after its one year in the market with two new models, the global channel could absorb as many of the new handsets as Apple could deliver. There's no issue with high iPhone 5c handsets shipments. Apple has always reported as units sold shipments to resellers when ownership of the devices change hands, not when those handsets are sold by resellers to consumers. Additionally, the iPhone 5c is sold in five different colors. This necessitates more product in the market as sales begin. Selling more than nine million new handsets while reiterating September quarter revenue guidance with millions of 5c handsets awaiting sales to customers might create an apparent paradox. But there's no mystery or conflict in the numbers. Apple's decision to focus its new handset efforts on the top tiers of the smartphone market and forego an aggressive effort to gain market share in emerging markets at this time is in line with Apple's approach to the company's primary product markets. iPhone revenue represented 53.8% of the company's reported revenue total over this 39-week period that ended in late June. 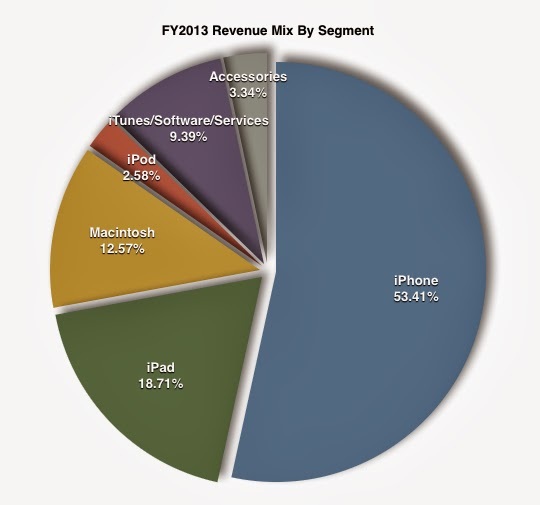 In FY2012, iPhone revenue represented 50.3% of the company's reported revenue total. In the first three quarters of the fiscal year, iPhone revenue rose15.7% versus 10.7% revenue growth for the company as a whole. In FY2013 which ended on September 28th, revenue from iPhone sales may have reached 55% or more of Apple's revenue total. The iPhone remains Apple's principal revenue and operating income driver. Emerging markets can wait for now as Apple seeks gross margin recovery and a return to net income growth. On Friday, August 16th, Apple's share price closed above $500 for the first time since January. The recent announcement by Carl Icahn of his investment in Apple, the completion of the first big phase of the planned $60 billion share repurchase program and better than expected iPhone sales in the June quarter have combined to catapult the share price off the 52-week low of $385.10 set back in April. From the all-time high of $705.07 reached last September to the 52-week low set in April to the closing price of $502.33 on Friday, Apple's share price has gyrated wildly over the past twelve months. Within weeks Apple will announce its fall product refreshes for the iPhone and iPad lines. Rumors and speculation about the company's forthcoming new products are again receiving broad press coverage. The product news will come at the tail end of Apple's most challenging fiscal year in recent history. In late October, Apple is likely to report negative net income growth for the fiscal year ending in September and a fourth consecutive quarter of tepid revenue growth. The deterioration in Apple's year-over-year profitability is due in part to the outsized revenue and earnings growth rates achieved in the prior fiscal year. 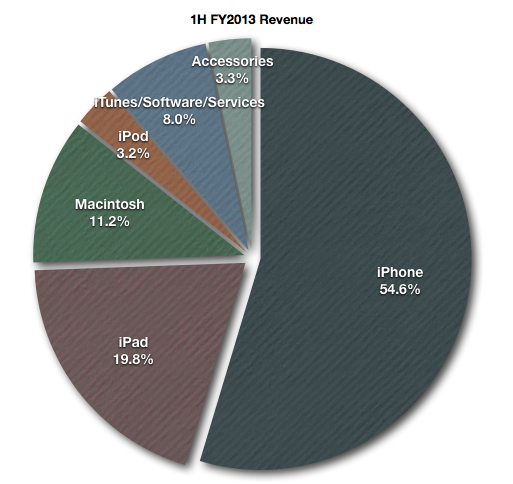 In FY2012, Apple's revenue rose 44.58% and earnings per share rose 59.60%. 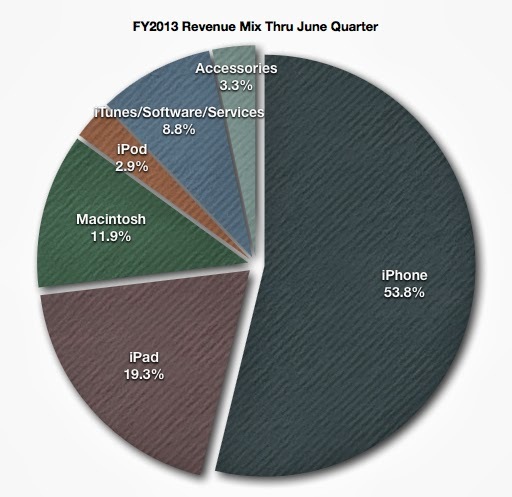 In the first three quarters of the current fiscal year, Apple's revenue growth rate was 10.7%. Net income, a better metric than earnings per share as Apple repurchases tens of millions of shares, is down 11.89% year-over-year. In today's article I am publishing a series of graphs that detail the recent deterioration in a select set of financial performance metrics and mention the challenges Apple faces as management strives to return the company to strong rates of revenue and earnings growth. The graph below illustrates Apple's revenue growth and revenue growth rates over the most recent fifteen fiscal quarters. Although the company has eked out revenue growth of 10.7% in the first nine months of the current fiscal year, due in part to a roughly $1 billion sequential drop in channel supply value in the recent June quarter, the reported revenue growth rate in the period was 0.86%. Apple is now experiencing its slowest rate of revenue growth in years and the revenue growth rate so far this fiscal year is below the 14.4% revenue growth rate realized in recession-plagued FY2009. The graph below illustrates Apple's earnings per share and eps growth rates by quarter since FQ1 2010. In the first three quarters of the current fiscal year, Apple has reported negative earnings per share growth. Over this nine-month period eps has fallen 11.61% year-over-year to $31.36. The recent negative eps growth is despite fewer shares outstanding in the recent March and June quarters. In the June quarter, Apple's $7.47 eps performance fell below the $7.79 per share earned two years prior in FQ3 2011. Saturday, March 30th will mark the end of Apple's second quarter of FY2013. With near certainty, the March quarter will represent the first quarter of negative net income growth in the company's recent history. It may also represent the low point in a multi-quarter cycle of reduced rates of revenue and earnings growth. In this article I will analyze Apple's growth performance since the first quarter of FY2011, why earnings growth will most likely turn negative in the current quarter and the ways in which Apple will begin to return to stronger rates of revenue and earnings growth as early as the June quarter of the current fiscal year. Apple's "March Quarter Madness" is the beginning of the end of a cycle of lowered rates of growth. The graph below illustrates Apple's rates of revenue and earning per share growth since FQ1 2010. Since FQ3 2012, Apple's rate of year-over-year earnings per share growth has fallen below the rate of revenue growth. This trend will continue through the March quarter due to the extraordinary high gross margin achieved in the first half of last fiscal year. The Graph below illustrates Apple's gross margin performance since FQ1 2010. It's not a coincidence Apple's gross margin reached extraordinary high levels in the first six months following the release of the iPhone 4S. The iPhone 4S is the second handset in the iPhone 4 series and delivered record gross margin due in part to Apple's ability to apply the fixed costs of iPhone 4 series production over a much larger number of units sold. In the recent December quarter (FQ1 2013), the first full quarter of iPhone 5 sales, Apple's gross margin outcome was nearly identical to the outcome in FQ1 2011, the first holiday quarter of sales for the iPhone 4 handset. Looking forward, Apple's gross margin performance will improve following the release of the second iPhone 5 series handset. Economies of scale on iPhone 5 series handset production will improve dramatically as the next iPhone 5 series handset finds its way to market. The trend is vividly displayed in the graph above. The first full quarter of release of the iPhone 4 handset (FQ4 2010) represents the low point for gross margin over a more than three-year period. On February 27th Apple will host its annual meeting of shareholders. While much attention is being paid to the company's holdings of cash and marketable securities and the recent sell-off in the share price, very little attention is focused on the company's organic growth. In the December quarter, Apple's revenue rose nearly 27% on an equal week basis and the company reported record revenue and net income in the 13-week period. The impact of "share creep" from stock-based compensation reduced earnings per share $.06 year-over-year despite a $14 million gain in net income and the 14-week prior-year quarter reduced the rate of reported revenue growth to about 17.7%. Due to extraordinarily high gross margin in the December and March quarters of FY2012, Apple will report negative earnings per share growth in the first six months of the current fiscal year. Although I expect sequential margin recovery from the December quarter's 38.63% through the March quarter of next fiscal year, Apple's rate of earnings per share growth in FY2013 will be the lowest rate of growth in the company's recent history. But there's much more to Apple's growth story. 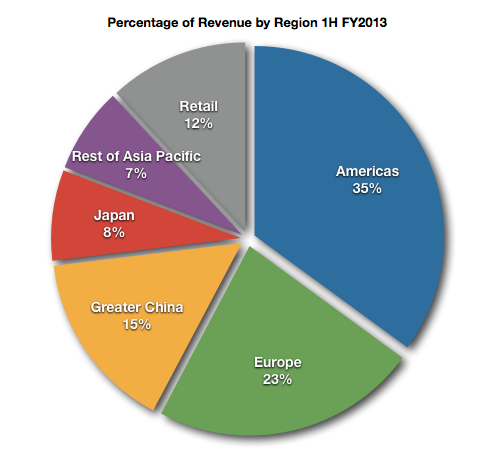 Apple manages its businesses on a geographic basis. 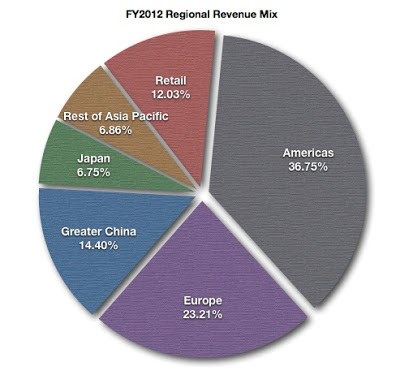 With the release of the company's December quarter results, management created an additional revenue region called "Greater China" and now reports revenue from other countries in the former Asia-Pacific revenue region as "Rest of Asia Pacific." Illustrated below is the percentage of recognized revenue delivered by each of Apple's revenue regions in the last fiscal year. Last fiscal year, both the United States and China represented more than 10% of Apple's reported revenue. The graph below illustrates revenue by region in the fiscal year and the corresponding rates of regional revenue growth. Under the headline "Apple Reports Record Results," the company delivered what appears at first look a modest performance in its December quarter. For the 13-week period ended December 29, 2012, Apple reported revenue of $54.512 billion and earnings per share of $13.81. The outcome represents revenue growth of 17.65% over the prior-year period and a slight decline in earnings per share from $13.87. However, the market's response to the December quarter results drove the share price down more than 12% to just over $450 on extraordinarily high volume the day after the release of earnings. Apple's overall revenue growth rate and the rate of growth in iPhone and iPad unit sales did not impress the Street. In the December quarter, iPhone unit sales rose about 29% to 47.789 million units and iPad unit sales rose about 48% to 22.86 million units. iPhone revenue growth tracked close to the rate of growth in unit sales, but iPad revenue rose only 22% year-over-year due to the influence of the lower-cost iPad mini. The graph below illustrates the rising percentage of Apple's revenue provided by the iPhone and iPad lines. In the December quarter, Mac unit sales fell about 22% due in large part to constrained supplies of the new iMacs. Apple ended the December quarter with Mac channel supply below the desired target range. As expected, iPod unit sales continued to decline. Apple sold about 12.679 million iPods, off 18% on a year-over-year basis. Apple's high concentration of revenue in its newest product lines, the 14-week prior-year period and lowered gross margin due to multiple product transitions in the quarter, created an outcome that underwhelmed investors. Gross margin dropped from last year's unsustainable 44.68% to about 38.63% in the December quarter. But there's more to the story.